As versatile as it is sleek and sumptuous, this dual-ended brush can be used for an array of products, including foundation, blusher and concealer, powder, cream and liquid formulations – phew! The subtly tapered end is ideally shaped for applying and blending base products, while the rounded, fluffier end is perfect for dusting and adorning cheeks. The vegan brush heads are beautifully soft and the weighted metal handle provides effortless control – and a welcome touch of luxe – to any make up collection. 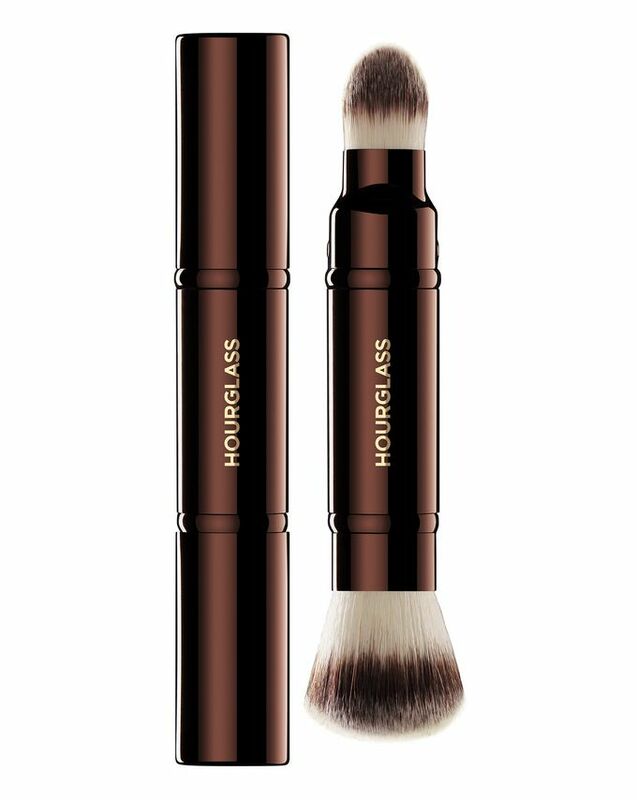 Versatile and luxurious, Hourglass’ Retractable Double-Ended Complexion Brush can be used for all manner of make up artistry – and it’s perfectly portable too. With two sumptuous (totally vegan and PETA-approved) brush heads, it’s ideal for acing your base and adding detail – the slightly tapered end is ideally shaped for applying foundation and concealer, while the rounded, fluffier side is shaped perfectly to adorn apples and cheekbones with blusher and highlighter. Whether you’re using powder, cream or liquid formulations, this sleek brush ensures a flawless finish, with a weighted metal handle to provide control and effortless blending and application. Use the rounded end for finishing powder or bronzer and the tapered end to adorn apples and cheekbones. Rotated use with beauty blender & Chanel foundation brush - No problems, good application. Sadly when I tried to GENTLY clean ( with mild soap ) the hair started falling out from brush :( Really disappointed. Beautiful looking brush. The powder end for blusher is fantastic - really soft and great quality. Found the foundation side not suitable for applying liquid foundation rather better for concealer or under eyes. Useful for traveling but will stick to my usual foundation brush.